Blockaid are a family owned and business and we’ve been operating for 23 years dealing in Drainage and Haulage. My name is Theresa Cox and I am the Business Support Manager, we are based in Longsight, Manchester. 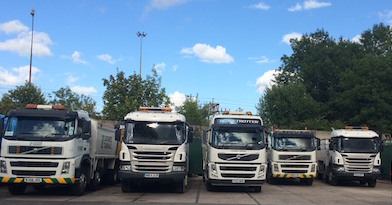 We carryout service and maintenance on all kinds of commercial drainage, interceptors, along with hauling Asphalt, Stone and Sand in our 32 tonne tipper vehicles. We continue to work toward further reductions in our fuel costs but have found this challenging this year with the government increases in diesel and petrol across the industry. We continue to use our tracking systems and Masternaut does assists us with better routing. We are always striving to improve our software to give better and more accurate findings. We were first introduced to FORS by Tarmac who we currently haul for, all their fleet is bronze standard. Going forward we believe it makes great sense to remain involved with FORS and stay ahead of the game by renewing our FORS Silver and Gold each year. We continue to perform best practice in our day to day running. We have now completed our second year at Gold Standard and are proud to note we are still the only haulier that haul for Tarmac in the Greater Manchester area who has achieved Gold. Initially, the FORS Bronze assessment was very thorough and we were a little nervous at to what it would entail, however once our audit had started it was clear we were going in the right direction as a lot of the information required, we had on file already. Three years on from our initial Bronze attainment we note the requirement for our Bronze audit has grown requiring more information as a basic requirement. We can see the benefits of this and keeping our bronze information up to date. We found the FORS website very helpful, it allows you to look at what is required and be ready for the next audit. Next year the fifth addition of the Bronze is released so hopefully by July 2020 when our bronze audit is due again it should just be a matter of attaching the information required. “Having the FORS accreditation has proved to be a major asset in gaining extra haulage contracts.” – Patrick Cassidy Managing Director. Having FORS gold has introduced us to contractors who are FORS Gold themselves and do not accept any hauliers that are less than silver. Therefore, having the FORS gold has allowed us increase our business this year and we have swapped out some of our older vehicles for newer ones. We have also continued with our E-Learning for our drivers which is improving their awareness when they are on the road. In particular the training module for Security and Counter terrorism which at least 80% of our drivers have now completed. If these modules were attached to the CPC qualification were sure a lot more drivers would welcome e-learning on a whole. “Having been a driver for many years I can see the benefit of the eLearning modules. They keep you up to date on any changes which you would not normally see from just driving your vehicle every day. I carryout my eLearning modules from the comfort of my home which makes things that much easier in our busy working lives.” – Jason Roberts – Specialist HGV Driver. What was your main reason/s for progressing from Bronze to Silver and Silver to Gold? Our main reason for our progressing to Gold was being able to display the FORS Logo on our vehicles, stationary and website to identify us to the public and potential clients as a company that takes its responsibility in health and safety very seriously and denotes where we are in the market place with our health and safety standards. Going on from this we continue to strive for the Gold standard as we have found an increase in the work we have attained this year. Recently securing a new contract with Hanson Aggregates. Driver health and fitness review – all our drivers sign a yearly confirmation sheet that they are fit to drive, they list any medications they are on and a one to one discussion takes place regarding any special requirements. We have recently had to stand down one of our drivers due to a heart condition. However due to his experience in drivers for 25 years we have re-deployed him within the business, re-trained him to carry out a non-driving role. Strategy for recruiting drivers – We advertise on our website, through indeed etc and confirm that training will be provided once a CPC qualification has been obtained. Noise assessment – Block aid has always been aware of the noise we create when working. Our premises are within a residential area and we have operated from here for 25 years. We have implemented our own noise abatement procedure, and this includes ensuring left hand turn audible warning is silenced after 6pm, our fleet has recently been updated with new vehicles (Euro 6) which are less noisy on operation than older vehicles, KPI’s on driving increasing coasting and less braking, silent vehicle washers etc., Model shift and alternative vehicles. Our plans remain the same, to grow the business within a safe environment, increase the number of vehicles we have, we have planned for a further two by March and possibly a further two by September. Steady growth means better safety, better training and increased revenue for our business. In conclusion our original main reason for becoming FORS accredited was to show how serious we are about safety. In turn we believe, going forward that all construction sites and contracts will require at least a Silver accreditation to prove your commitment to safety before you are able to proceed to work on their sites.